The Father says today, don’t look at the things that are seen but the things that are unseen. When you look at the seen, you will ask questions such as “why does God allow this or that to take place?” That is not the question that pleases Me or glorifies Me, says God. The question is, what do you want to look different in your life? Have you asked and asked in faith? Nothing is impossible to the person who looks not at the outward condition asking why, but rather looking at the unseen promise and declare it into existence by the word of faith I have imparted to you. Let your mouth pray. Open your mouth wide, and I will fill it with My word. As My word proceeds out of your mouth, it will become manifest substance in your life. You are not a child of deprivation. I have not called you to denial, I have called you to the entitlement of sons. Say in your heart every day “as He is, so am I on the earth…” It doesn’t matter whether it looks like that is true or feels like that is correct – it is the most fundamental truth of your life. Know this and embrace it as your underlying sense of reality and guess what? It will be made manifest, and suddenly everything you say and do will become as valid as if I said it or did it. I received my word of prophesy from Russ and Kitty and it has changed my life. God has become so real in my life that I cannot put it in words. The scripture of reference for my life has made my life worth living. It has become my daily weapon and my shield. I live by this word and I meditate on it as I go on with my life. My prayers have become meaningful and enjoyable conversations with my Father. I feel so loved. Thanks Russian and Kitty for drawing me closer to my Father. I am so grateful I came across this ministry which has given me such a fresh start. . Glory to the Almighty God. I received a word o prophesy from Russia and Kitty and I have started seeing things differently and am so fulfilled. It feels like I am now speaking to my Father face to face. God has become so real and I am growing spiritually to a point that all I do is think of heavenly life and am nor scared of anything. 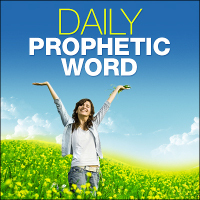 I look forward to reciting the daily prophetic word which fortifies me to kickstand my day. My days have become brighter and o positive.I bless the day that I found this ministry. The personal scripture I got to meditate on has become such a weapon in my life that I have started wondering how I previously survived without it..I am so greatful to Russia and Kitty for drawing me closer to my Father. I find each day worth living and am always excited to start with another adventurous day ahead of me. Ai enjoy being in conversation with my father, that’s what my prayers have turned to. …..conversations,devine sittings with Jesus. I have discovered love that I never knew existed. Thank you so much..I cannot thank you enough. Stay blessed and let this ministry take over the world. I received a prophetic word from Russ and it was a word filled with love from the heart of the Father. I was encouraged and felt special. I am looking forward at the things which will be unfolding in my life as I continue walking in the destiny chosen by my Father. For now I will be careful by choosing things. Thank you Russ, for I was drawn even to buy some of your books, and I will be reading a daily prophetic word. May you be blessed greatly in the work you are doing. You both are special to God and to me. « Retrieve Your Giving Day Download for September!